You’ve probably come across Thumb Drive Viruses when you connect your thumb drive to a computer at work or at school. These viruses copy themselves onto a thumb drive as soon as it is connected to an infected computer and the second they’re connected to any other computer, the virus spreads on that machine as well. Since you may not be able to remove the virus from the infected computer (due to insufficient admin privileges, etc. 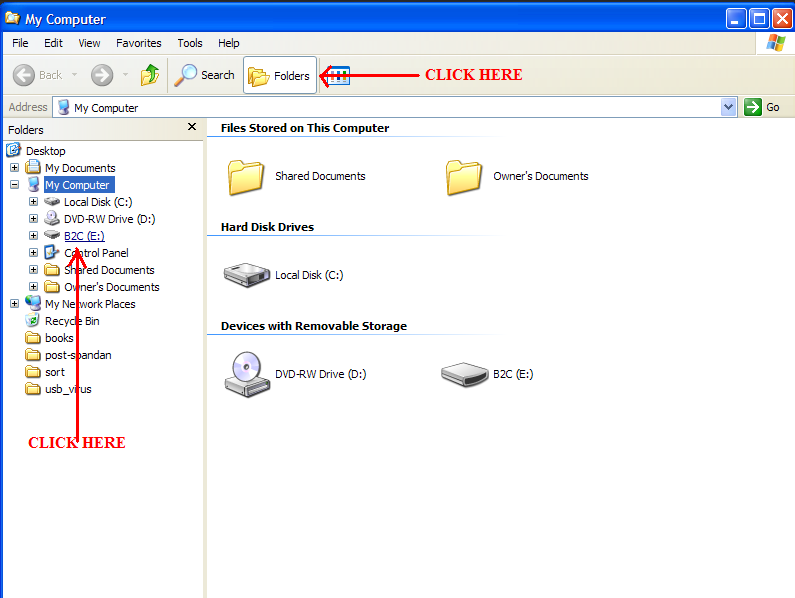 ), you can ensure that the virus on the thumb drive does not spread on another machine. Suppose you’re not sure if your thumb drive is infected or not and wish to connect it to your computer without taking the risk of infecting it. To ensure that the virus does not start, Hold Shift and insert the thumb drive into the USB Port. This will prevent the AutoPlay function from being executed from the thumb drive, and hence does not start the virus when the thumb drive is inserted. Although the virus is an exe file, it uses the directory icon to fool users into clicking it. Though not all viruses do this, it’s still worthwhile to check if the icons have been changed. 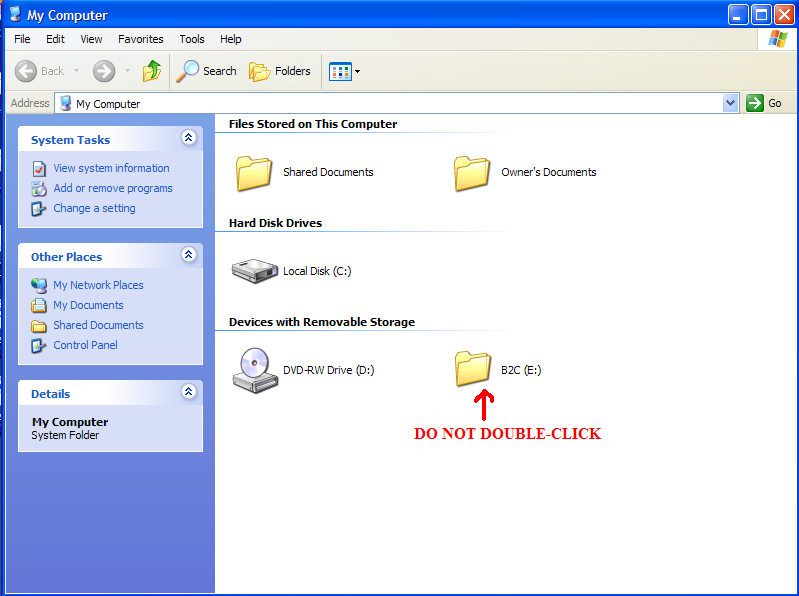 Now, if you want to access the files in this pen-drive, DO NOT DOUBLE-CLICK THE THUMB-DRIVE ICON as it starts AutoPlay and will execute the virus program. You won’t see any viruses as they are hidden. What’s worse, since they are also marked as system files some anti-virus programs ignore virus scans on such files. This is the time to use the second technique. Click Start->Run and type cmd and press Enter. 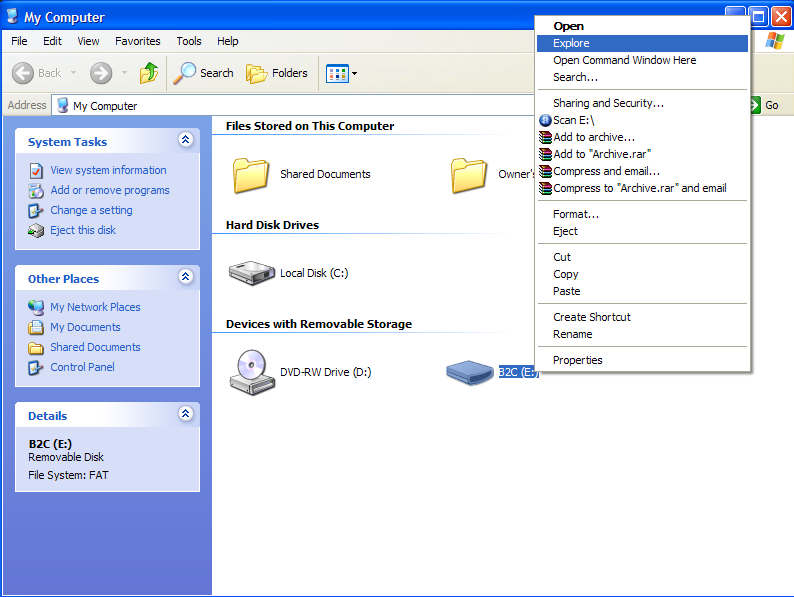 Once you see the command prompt, type [USBDriveLetter]: and press Enter i.e. E: in this example. 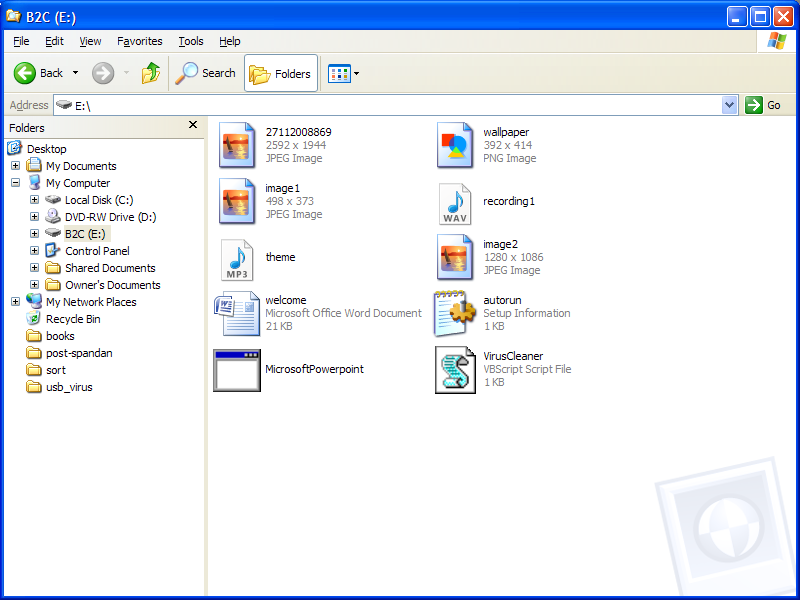 You’ll notice a few files with the SHR File attributes in this window. One of these files will be autorun.inf, which instructs the OS which applications to run when the thumb drive is inserted. 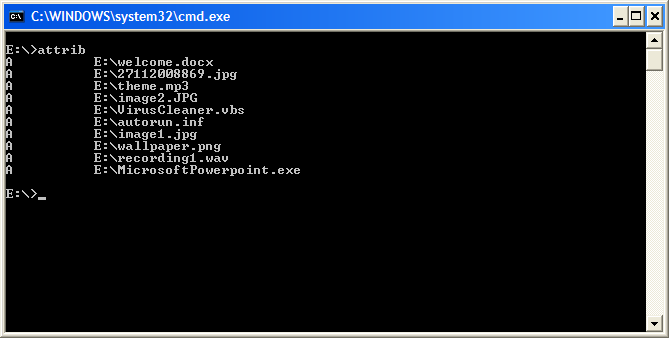 The other files will be .exe, .vbs or .pif files and are usually the viruses that you are looking for. Cool, now open Windows Explorer and you’ll notice that the viruses are now visible. The next part is simple, choose all the viruses and delete them. You should also delete the autorun.inf file unless your thumb drive is made by SanDisk (SanDisk thumb drives depend on autorun.inf to start its own utility programs). If your thumb drive is manufactured by SanDisk, open the autorun.inf file and simply remove all lines that contain the virus filenames. That’s all. Your Thumb Drive is no longer infected. There’s something you should take care of though. Many Thumb Drive viruses make copies of itself in every directory on the thumb drive. 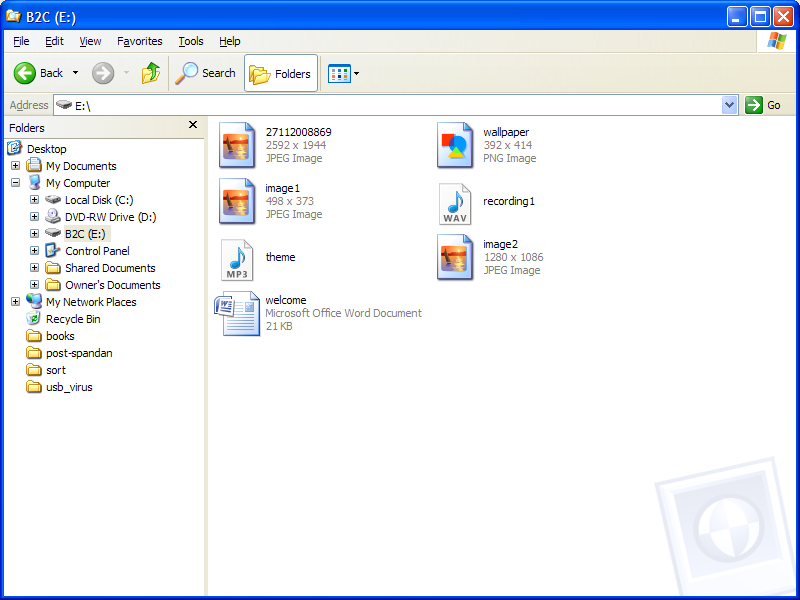 If that’s the case then you will have to perform the above steps for each folder or use attrib -s -h -r /s *. * to unset SHR attributes of all files in your thumb drive. You can then delete them individually. To play safe, instead of relying on pressing Shift every time you insert your thumb drive, it is wiser to disable autorun for all removal drives so that Autorun.inf is never executed when your thumb-drive is inserted. Once that is done, you no longer have to press Shift to disable autorun every time you connect your thumb drive. However, you will still need to use the attrib command to unset file attributes and delete the files manually. You can also use Ninja PenDisk to do the same thing automatically but I suggest doing this on your own as Ninja Pendisk may not be able to detect and remove all viruses. Some “USB-Viruses” hide all directories on your thumb drive and replace them with exe files (i.e. the virus) having the same name. This will make all the hidden directories visible again. Thanks for the info. I wanna learn more about how to defend yourself from viruses… Where am i gonna start? How did you come up with this idea? I was able to protect our computer from a certain virus and i deleted it. Do you have other techniques? Please Email me for more interesting sites. Being significantly pleased to reveal this web-site.I wanted up to credit must go throughout the the part of your in attentiveness of such ideal impute on!! Which i without-doubt delighted with each individual website minimal amount of trace from it and i partake individual book-marked so that it will interested in real bushy-tailed things the person writing.